Enlight’ning magazine has gone digital. After a print tradition spanning 12 years, the award-winning art and literary journal, published annually at Harker’s middle school, is now available exclusively online. At the end of May, Enlight’ning moved to an all-digital format, joining a growing trend in publishing. This move should give the magazine a wider readership, as it is now available to anyone with web access. The preview edition is available at http://enlightning.harker.org. Like its print predecessor, the online publication will showcase artwork, poetry and prose created entirely by middle school students. But the digital format makes it more interactive. For example, the current issue contains songs by numerous student musicians, as well as a video upload about Bollywood. The video, titled “A Glimpse of Bollywood,” was made by grade 7 student Devanshi Mehta. The online journal had taken its “first baby steps out into the greater world,” explain Enlight’ning editors, adding that by the end of summer the website will be more fully constructed and boast a stronger multimedia experience. There are still a few glitches to be worked out, so the editors advise readers to use Chrome or Safari browsers, not Firefox, for the best user experience. Also, to see the text as it was intended (either from the central scrolling area or from the “category” listings), click on the titles, as clicking on the photos and artwork will enlarge them to full screen. 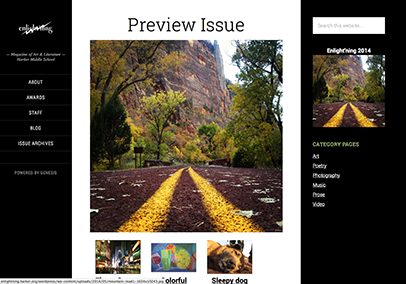 Current features of the online magazine include a blog and issue archives, as well as category pages for art, poetry, photography, music, prose and video. Faculty advisors for this year’s publication were Sabina Grogan, middle school expository writing instructor, and Bernie Morrissey, middle school librarian. “Enlight’ning Online can now publish a greater variety of mediums, including more photography, as well as music and film, representing a wider range of the creative work of Harker middle school’s students. We hope some day Enlight’ning may serve as a central hub of arts at the middle school,” wrote magazine editors and rising grade 9 students Praveen Batra, Nastya Grebin and Andrew Semenza.